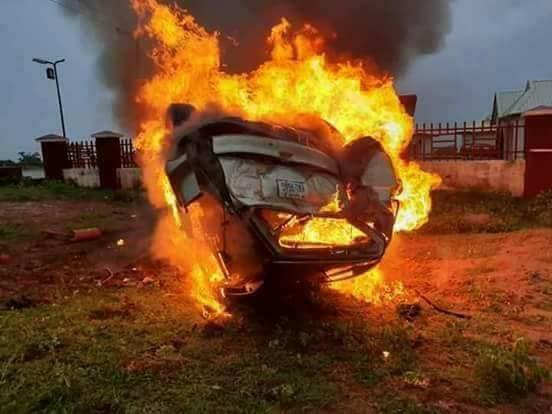 According to a report by Premium Times, three APC members from Kano State died in a car accident in Zaria on their way to Abuja on Saturday morning. The deceased include a councilor representing Diso ward in the Local Government Area of ​​Gwale in the state of Kano, Abdulwahab Inuwa, and two of his friends, Abdullahi Idris and Abubakar Diso. According to reports, they left early on Saturday to join other APC members at the convention in Abuja. An eyewitness, Murtala Lawan, told Premium Times that the Honda CRV carrying the deceased did a somersault in the town of Amaryawa, a few kilometers from Zaria. He said they were trying to rescue the deceased when the car burst into flames. Mr. Lawan said they saw the three dead burn because they could not put out the fire. A younger brother of the deceased counselor, Bello Inuwa, told reporters in Kano that the family received the sad news of a good Samaritan who called the family. He explained that his brother has just returned from Islamic Umrah in Saudi Arabia six days ago. The funeral prayer for the deceased was performed by the Imam Chief of Kano, Sani Zaharaddeen, at the Central Mosque in Kano around 4:30 p.m. on Saturday.